The BBC’s documentary “Fashion’s Dirty Secrets” by Stacey Dooley kick started in many heads a long overdue string of thoughts. But is it a movement yet? And what does it take to become a movement? 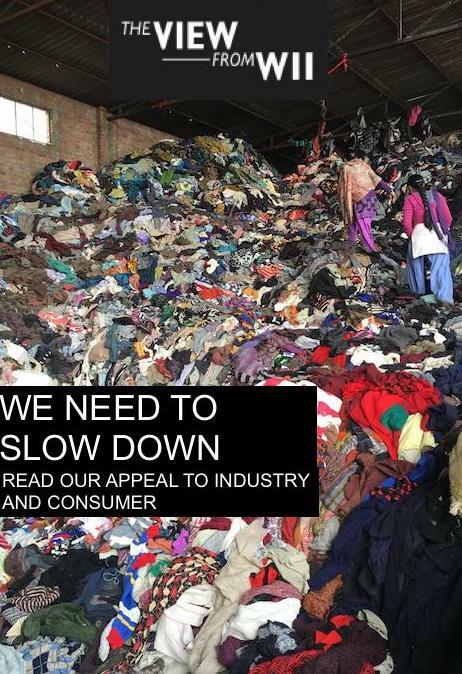 Do we consumers think at every purchase about the material our clothes are made from? About who makes our clothes, or what happens after we throw them away? Often the answer is ugly. We all have to contribute by turning our thoughts into values and principles to achieve the needed changes to safeguard our livelihoods. A study by Ellen McArthur Foundation found that one garbage truck of textiles is wasted every second; the Copenhagen Fashion Summit reported that fashion is responsible for 92 million tons of solid waste dumped in landfills each year. Trying to imagine these 92 million tons of clothes waste in volume surpasses imagination of the many. The fashion industry is also the second-biggest consumer of water and generates more greenhouse gas emissions than all international flights and maritime shipping combined. Synthetic microfiber pollution is washing up in our oceans at alarming rates killing around 100 000 marine animals each year by plastic waste including micro fibres. Brands and consumer have to rethink their business habits and consumer habits – we cannot continue to produce and consume clothes without considering our environment and human rights. The responsibility lies with all participants of the market, the fashion brands as well as the consumers. The fashion brands finally have to take responsibility for the waste they are creating as well as taking human rights into consideration during the production process. There is evident urgency in addressing head-on the use of chemicals, waste and bio diversity as well as unfair working environments. Big players in the fashion industry whose business models were missing the environmental consciousness and fair working environment in production are starting to take responsibility by re addressing their business policies and signing up for Make Fashion Circular initiative. It aims to improve the industry’s record on sustainability and reduce global waste from fashion by recycling raw materials and products. Recycling is certainly one part of the solution, but by no means is the only solution. It’s a multilevel issue and brings many questions along such as how can we eliminate the need for recycling altogether? How does design add to the solution? To shift the linear take-make-waste fashion towards a circular model with no waste, everyone needs to be part of the movement to innovate and redesign the industry. We can start by changing the mindset from buying to quickly dispose to buying to keep and build a wardrobe upon. Good design may be minimalist or opulent, basic or fashion forward, but what each character shares is that good design will never be unwearable, out of fashion. We consumers are the electorate who vote with the wallet. The average number of clothing collections in Europe more than doubled between 2000 and 2011; more clothes were bought and worn less. It will take time for the fashion industry to slow down. The trend is already set in motion by a variety of initiatives but we all need to play our part. We as a brand take ours with slowing down the relentless pace of production by offering trans-seasonal items designed to outlive trends, product drops when we see fit, sourcing responsibly the cashmere yarn and ethical manufacturing with our partners who share our values and have the artisan skills to produce a mindful luxury product. As consumers, we at London W11 ask questions each time we purchase a garment and the answers have to be comforting.